Bird House Camera - Your Very Own Nature Channel! 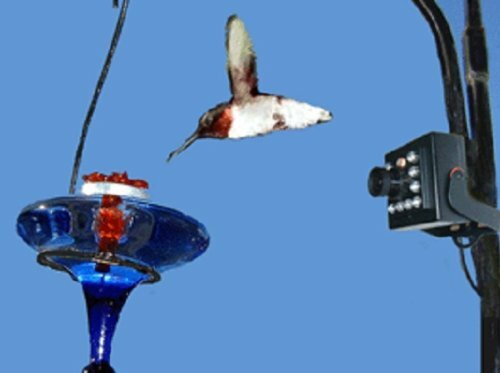 As I was researching ways to really get up and close to my backyard feathered friends and critters, I came across this bird feeder camera or bird house camera that I would like to get. I actually have it on my wish list for anyone looking for a gift idea - Hint Hint! This is really cool. It is tiny enough to fit in a bird house but is also weather proof and you can fit it on a bird feeder or near the feeder to watch birds eating. There is a line that runs from the camera to your television so that also includes audio so you can see your little friends up close and also hear them. Once the sun goes down, there is a infrared lighting that is invisible so that you can see what goes on at night in your backyard without disturbing them, that part may surprise you if you have been wondering where all that bird seed has been going! ​I think this is a really cool gift idea too, and what a wonderful way for kids to see birds up close on the TV or squirrels or all the activity that goes on in that part of your yard. If you are following any of the homemade bird food recipes on this site then you know all the birds are loving your house, so it would be fun to see them up close. I love the idea of this camera. The birds get used to it being there and you can can some really cool up close pictures and video of your fine feathered friends! As you can see in this picture, they are watching a hummingbird. Can you imagine being able to see little birds hatching and being fed? I think this would be better than a video game and would definitely help children understand nature without going to near them. As you can see in the picture, the camera is quite small. This is professional grade, and would be great for observing all wildlife in your yard! You can see them during the night or daytime. If you like the idea of seeing nature up close but without intrusion, these cameras are a great investment for yourself or for the bird lover on your list. I would love to get one of these into a bird house before the season starts so as to watch birds nesting. This little bird feeder camera has enough light to show the inside of a bird house without disturbing the birds. Otherwise using it outdoors (it is weather proof) at the feeder will give you the most activity. Just make sure and secure it so that animals don't mistake it for food!